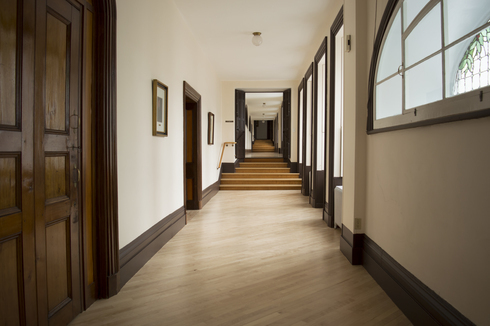 The Ursuline Monastery of Quebec City has undergone many changes over the course of its history. This corridor is a perfect example. It is divided in two. The lower part is the Parlor wing, constructed on Cap Diamant. It did not have a raised vault; is was constructed on the rocks of Cap Diamant. The upper part is the Saint-Ursula wing, built over the ruins of Madame de la Peltrie’s former church. As the crypt was spared during the fire, and could not be moved, the wing was built on top of the crypt by lifting the new building.